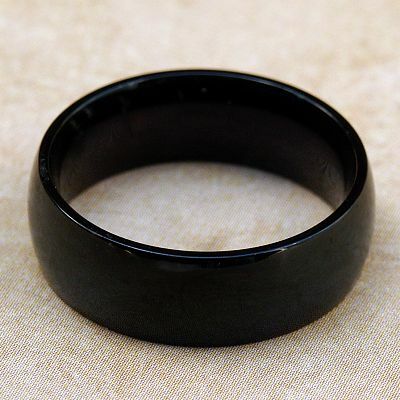 - Equally at home on men's or women's hands, this stunning jet-black ring is a distinctive (and economical) alternative to traditional gold and silver jewelry. Made of stainless steel, with a durable, plated finish, this ring measures 7mm wide (approximately 1/4"). Choose Size... Size 9 Size 10 Size 11 Size 12 Size 13 Size 14 Please choose the Size. Do you have any other questions about our Basic Black Wide Ring?